As is their wont, the good people at Marvel Comics have chosen to promote a high priority initiative by spoiling its ending in a popular newspaper. In this case, that initiative is the "Death of Spider-Man" storyline presently running through the publisher's Ultimate Comics Spider-Man and Ultimate Comics Avengers vs. New Ultimates series, and the newspaper is the New York Post. To be more accurate, Marvel Editor-in-Chief Axel Alonso didn't spoil the ending of "The Death of Spider-Man," as such, but did reveal what will happen after the story's conclusion. 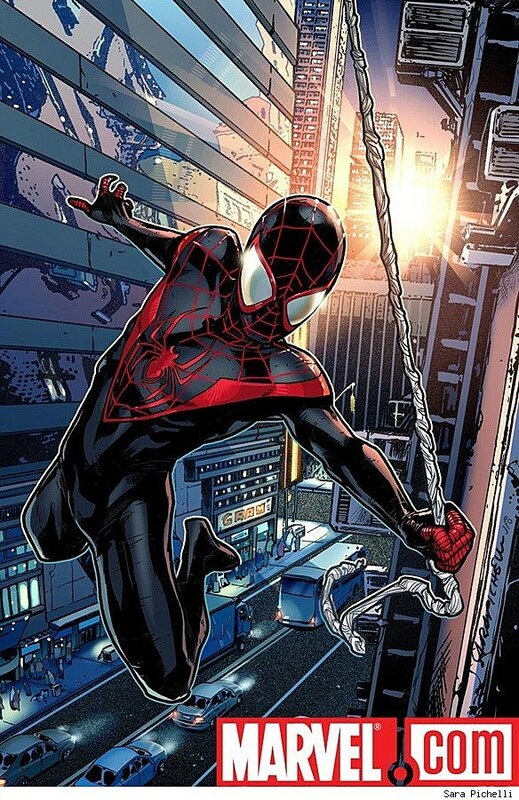 However, much about the storyline can be gleaned from what is behind the jump, so continue with full knowledge that THERE BE SPOILERS AHEAD.Whether Peter Parker will actually perish remains in question, but a new Spider-Man in a new costume will emerge after the conclusion of "The Death of Spider-Man," Alonso confirmed. "That's not Peter Parker," Marvel editor-in-chief Axel Alonso told The Post. "There's going to be someone new wearing the costume." Last week's Ultimate Comics Spider-Man #157 ended with Spidey taking a bullet to the chest courtesy of The Punisher, in a clever reference to the character's first appearance in 1974's Amazing Spider-Man #129. While that would be a fairly poetic way for Spider-Man to die in the Ultimate Comics Universe (a separate continuity from that of the regular Marvel Universe, where Peter Parker is a not-dead adult whose adventures are chronicled in Amazing Spider-Man), that the "Death of Spider-Man" story does not end until June's issue #160 would suggest that Parker will hold out at least a short while longer. You can easily catch up on the "Death of Spider-Man" storyline by downloading the issues with the Marvel Comics app or ordering them online at Things From Another World.